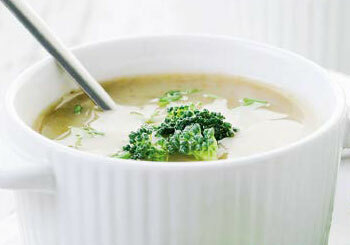 This is a light, easy to make, vegan cream of broccoli soup. The creaminess comes from the soaked cashews, alternatively use a few tablespoons of tahini if you have no cashews or you are pressed for time. Wash the broccoli. Cut off the thick stems, chop into smaller pieces and set aside to cook with the potatoes. Split the broccoli heads into smaller florets and set aside. soften, and then remove from the heat and set aside to cool to about 110º F / 45º C.
boiled potatoes, broccoli stems and florets with some of the water and blend to a form a creamy texture. Add back to the pot along with the pumpkin seed oil and stir well. Add salt to taste and serve with a sprinkle of hulled hemp seeds.